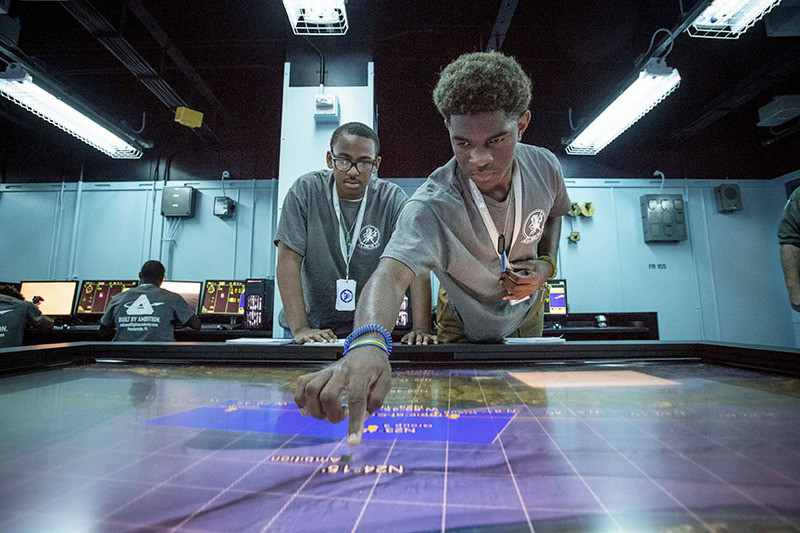 From week-long camps to single-day STEM experiences, the National Flight Academy in Pensacola, Florida, offers interactive learning opportunities for student groups. Imagine living on an aircraft carrier, sleeping in staterooms, coordinating aviation missions and executing them, all before you graduate high school. This isn’t a military story, this is the experience students will have at the National Flight Academy. 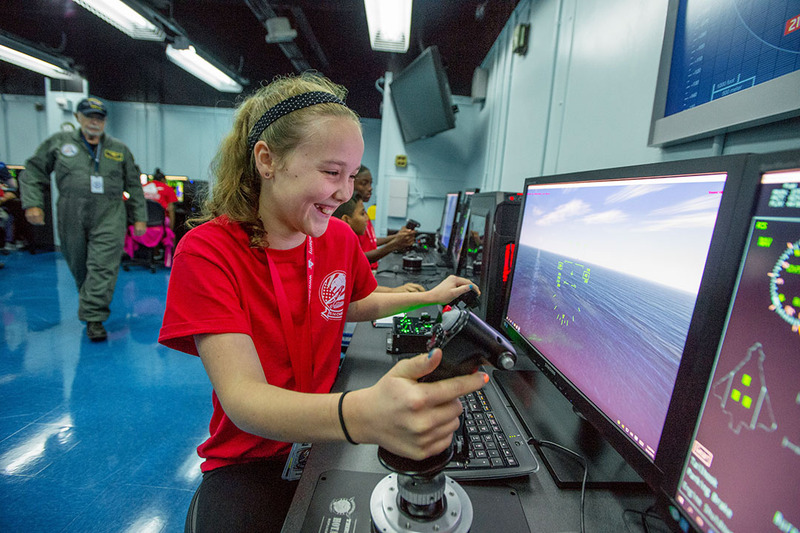 Through the NFA’s immersive, interactive and hands-on programs, students become familiar with the world of aviation while simultaneously building math, science and engineering skills they can apply in their everyday lives. The National Flight Academy, located near the National Naval Aviation Museum in Pensacola, Florida, offers an exciting learning experience designed to educate and inspire students through an aviation-themed adventure. Deployments, the flagship program of the National Flight Academy, is a week-long program for students in 7th-12th grades. 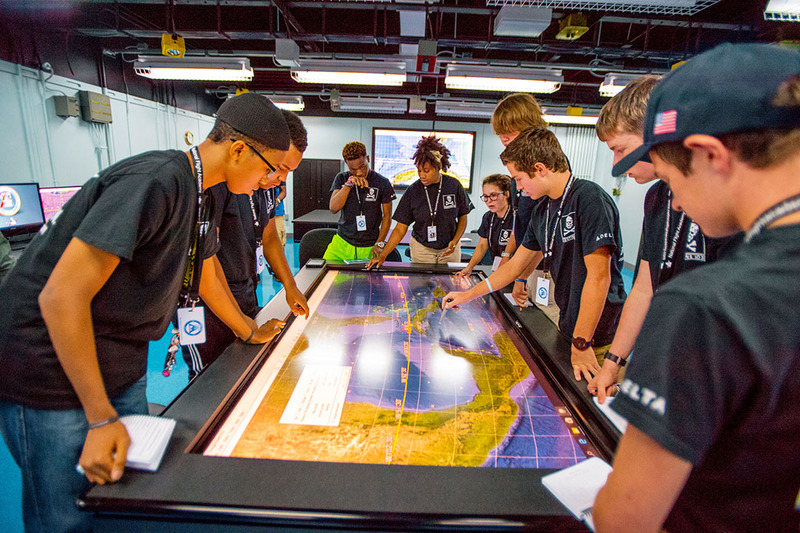 The students are stationed on the world’s largest virtual aircraft carrier, the AMBITION (CVT-11). Students will live in a multi-story facility for six days, where they will become Ambition eXperimental Pilots (AXPs), experience theme park-like thrills and become familiar with advanced technology. The first deck of the facility houses the galley, mess deck, administration and the main simulator bays. The second deck features the dedicated academic spaces and the Simulation and Immersion Center spaces. The third and fourth decks comprise student aviator lounges and activity rooms. While AXPs are aboard, they are given the opportunity to plan missions and execute them in a networked flight simulator. They will compete within squadrons to successfully finish the tasks given to them, employing science, technology, engineering and math skills in tandem with important skills like critical thinking, problem-solving, teamwork and communication. Throughout the week, the missions become more advanced and complicated, challenging students and helping them advance their aviation science skills along with communication skills. Deployments, which are six days long, is not the only student program at the National Flight Academy. In fact, there are many other options that younger students can take advantage of. Cruises, which are three days long, are geared towards 5th-12th grade students as an introduction to the flagship program. In this three-day course, students are introduced to numerous aviation concepts, such as meteorology, aerodynamics, bathymetry, physics, mathematics and the basics of flight. As in Deployments, AXPs will work in a squadron format, using their creativity, innovation and critical thinking skills to collaborate on and complete tasks. Students will apply these skills when they fly the X-12 Triad, the National Flight Academy’s experimental aircraft, which offers hands-on comprehension of the concepts of flight thrust, hovering and target drop. Adventures is a one-day opportunity for kindergarten-through-12th grade students. Through topics such as drones, hurricanes and tsunamis, the program introduces them to science, technology, engineering and math skills. The full-day program allows students to enjoy lunch on the mess deck of the Ambition and fly the X-12 Triad. While not as robust as the other two programs, Adventures is an ideal option for young students getting their feet wet in STEM. The Academy also hosts STEM Saturdays, a hands-on education program for grades 3-8 that focuses on a different science, technology, engineering or math topic every week. Upcoming topics include Robotics & Future Technology (where students will design their own robot to put out a fire), Jets in Flight (which includes a experience in a T-6 Texan II simulator) and the Science of Diving (which explores how divers maintain a healthy pressure underwater). The National Flight Academy offers students a one-of-a-kind experience with its exciting and immersive adventures. The tasks given to students will push them to new heights, inspiring problem solving and creativity while building their mathematical and scientific knowledge. Hands-on learning is one of the best ways to educate students and help them retain the lessons to use later in life. The National Flight Academy is the perfect place for a unique student field trip, and it’s an experience your students will cherish for many years to come.